Village Burger is a little hard to find. As it turns out, that’s one of it’s best features. The place has a lot to live up to. Chapel Hill is home to Al’s Burger Shack, Buns, and Top This, all truly excellent burger places. But as Michael said, Village Burger doesn’t even live up to Wendy’s. We had a difficult time finding Village Burger. It’s tucked away in University Mall, near Southern Seasons. Given the gorgeous website, great logo, and the claims of a world famous chef char grilling burgers and placing them lovingly on a buttery brioche bun, our expectations were high. The website actually includes the words “gourmet work of art.” Well, all right then. Please bring us a great burger. Make us sing your praises. We’re happy to do so if the burger is that good. The burger at Village Burger wasn’t. Let’s be honest here. Writing a bad review can be a lot of fun. You can be snarky and mean and hilariously funny. Village Burger doesn’t warrant that. We don’t really want to write bad reviews. We want places to succeed. We want them to wow us with a spectacular burger. Places like Al’s Burger Shack do that. They blow our minds and we’re deliriously happy to write a great review. If we can sneak in a little humor, that’s great. The truly awful places get funny reviews that include the smackdown they deserve. Those are fun to write because we don’t have to hold back. This is somewhere in between. Village Burger is a strip mall food court burger, and not a good one. Chad had the Village Burger, a 1/3 lb of purportedly Angus chuck with feta cheese. It was overcooked, under seasoned, and dry. 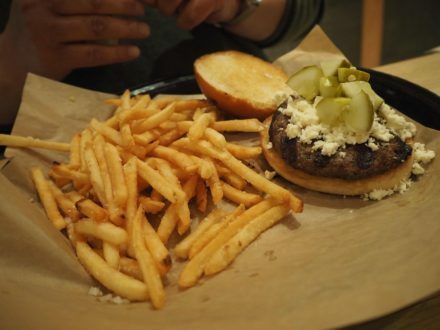 Feta cheese is pungent and salty, but it barely added enough flavor to make the burger palatable. Chad went back for pickles to add to the toppings, hoping for something to add some flavor. It was a hopeless task. The burger tasted like something you might microwave at a convenience store at 3:00 in the morning. The fries were good, though. On the Straight Beef scale, this was a 2 out of 5. Michael had the Village Burger with cheddar cheese. This burger suffered from what I call Elevation sickness. Elevation burger spends a lot of energy touting the ingredients, but does not deliver where it is important. It misses out on the little things like taste, build, and being cooked properly. There is a burger in there behind all the tots and lettuce. 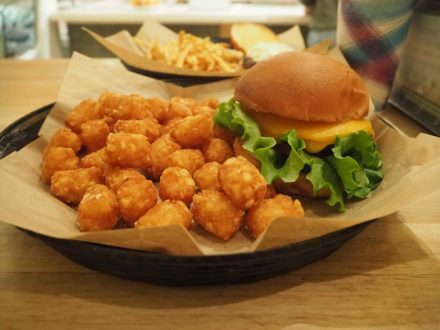 The tots were excellent, though, and abundant, as though they were trying to make up for the lackluster burger by engulfing it in tater tots. Michael’s rating is 2.5 out of 5. Don barely remembers his burger. When asked his thoughts he replied, “What were we talking about? The burger? I have no recollection.” Either he blocked it from his mind, or it was solidly forgetful. Don’s rating is 2.5 out of 5. Overall rating 2.33 out of 5 for 70 out of 73.